Samedi l’évènement rugby de l’année s’est clôturé à Londres dans le mythique stade de Twickenham. The world rugby event of the year ended this Saturday in the legendary Twickenham stadium. L’occasion pour Franck Mesnel de retrouver son ancien adversaire David Kirk, capitaine des All Blacks, qui fut le premier joueur à soulever la coupe Webb Ellis. This was an opportunity for Franck Mesnel to meet again David Kirk, former captain of the All Blacks in 1987, first player to lift the Webb Ellis Cup. Ils ont pu assister à la troisième victoire de l’équipe de Nouvelle-Zélande, qui a reçu le trophée des mains du président de World Rugby, Bernard Lapasset, habillé par Eden Park, ainsi que du prince Harry. 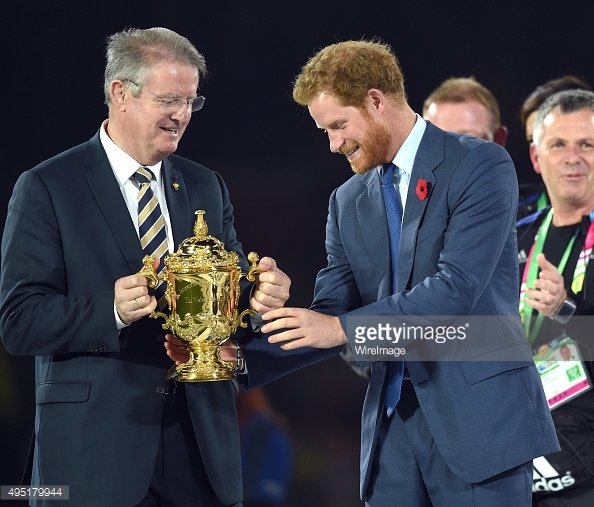 They attended the third victory of the New Zealand rugby team which received the cup from the World Rugby CEO Bernard Lapasset, wearing Eden Park suit, and the prince Harry. Rendez-vous dans quatre ans au Japon ! See you in four years in Japan ! Un weekend à Londres ? – Weekend break in London ?